Welcome to my house painting guide. It is my goal to provide you with the most comprehensive information when its time to paint your home. Painting is the most affordable and quickest option when its time to decorate or improve your home. Use these painting ideas and techniques to do it right the first time and have years to enjoy your efforts. Do You Know How to Paint a House? You’ve arrived at the right place whether you want to know how to paint a homes exterior or interior. Either way, knowing the right way to paint–knowing the secrets of professional painters–can really make a difference. This site is The Practical House Painting Guide. My name is Karl Crowder. 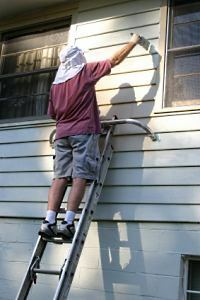 I have been a professional painter for over 20 years, and I’ve seen many paint jobs go wrong. That doesn’t have to happen to you! I started this website so you can learn the house painting tips and tricks the pros use every day! Painting is one of the fastest, easiest, and cheapest ways to add real value to your home. Quality materials and proper technique are critical to achieving a durable, cleanable, and easy-to-maintain finish. As you explore this site, you will find all the information you need to paint your home yourself like a professional. Many painting techniques are easy to achieve, while others are more difficult and challenging. Whether it’s stain and finish work or interior and exterior painting of your home, this site will show you how to paint like a pro and do it right from the start. Do You Know How to Start Your House Painting Project? If you’ve never painted before, you may feel frustrated or confused by all the messages out there. This website is a comprehensive house painting guide that walks you through the process step-by-step and additional articles on different types of painting needs you may encounter in your home. When your project involves residential painting, turn to this resource. Our goal is to help you achieve beautiful and professional results both inside and outside your home. Do You Want House Painting That Lasts? You’ve seen paint jobs that start to peel within a year. That doesn’t have to happen to you. Learn the tips and procedures that keep your paint job looking good for a long time! We share real professional painting tips. You can achieve the same results as the professionals. Do You Want Painting Ideas? This site includes an expanding collection of interior and exterior painting ideas and techniques—ideas you may never have thought of!